Steven Furtick is a 31 year old pastor, who has had a lot of success in his short ministry, and should have a lot more in the future. 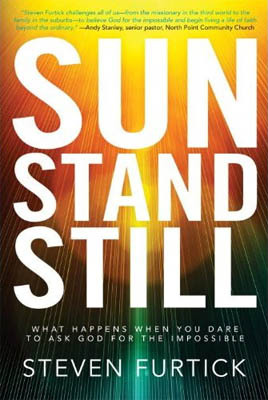 The sense of optimism and confidence from this success exudes in his first book Sun Stand Still. This book is great for a young person with big dreams, and an older reader who need to be reminded again what it feels like to dream big. Furtick is a good writer, so it will be fun for those of us who follow his ministry to watch his writing develop as his life and ministry continue to expand. On a personal note, I met Futick in 2009 when I was visiting Mac Richard in Austin. Furtick was a really nice guy, and he gave me some advice that has really helped CIL. I’m reading that book now. It’s very inspiring! Very cool, Ramona. I’m glad your enjoying it too.